This beautiful ground floor apartment is situated in the Terracos do Pinhal area of Vilamoura and is decorated to a very high standard . Major refurbishment of the apartment gives guests the feel of luxury but with all the self catering amenities you need to enjoy a home from home feel, including free WIFI. . The bedrooms are furnished as a double (master) and two single beds in the other, with 2 large sofas in the living room to accommodate total of 6 people in the apartment. There is a large terrace to the rear of the property which is south facing and has access via the lounge and master bedroom . there is also a large terrace to the front with access via the kitchen and bedroom .The rear terrace gives easy access to the garden and two pools, one a children's paddling pool. There is also a children's play area at the end of the road . New for 2017 an outdoor whirlpool spa . 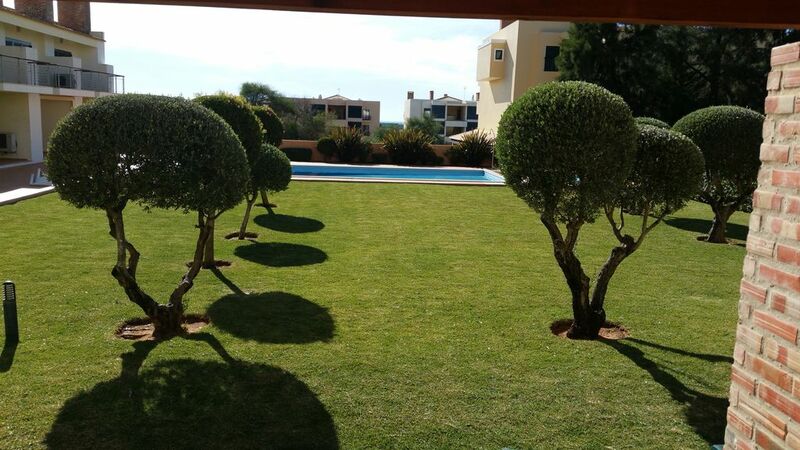 This is an ideal location for your relaxing summer holiday as it is in a quiet and secure complex, the centre of Vilamoura and the award winning Falesia beach are just a short 3 minute drive away. This area is also surrounded by top-class golf courses, making it an ideal choice all year round holiday. Golfing holidays: This apartment is in an ideal location for golfing holidays as it is very close to the Millennium Course, which opened in 2000 and also the World Class Championship Victoria Course, which was opened by Arnold Palmer in 2004. The Laguna, Old Course and Pinhal courses are also nearby, with Vila Sol golf course about a 5 minute drive away. Bathroom 1 is En-suite to master bedroom . Bathroom 2 has recently undertaken a major refurbishment and now has a double walk in shower with douche head and side power jets and floor to ceiling tiling . Towels are provided for both Bathrooms . High speed fibre optic WIFI with 200 TV channels. All towels provided including beach towels and parasols . Dining table situated in lounge seats 6 people also dining table situated on outside terrace seats 6 people . Bose sound system in living room . Large balcony leading from living room and master bedroom . Smoking is allowed on terrace areas - No smoking inside apartment . New for 2017 Hot tub / spa on outside terrace . This is an extra cost not included in the price of the holiday please ask for further details . Owner has really thought of everything. A lovely place to stay. Mr and Mrs Hill H.
A clean modern apartment with the pool close at hand. The owners are very welcoming and friendly. They are extremely helpful. They supplied us with an extensive welcome pack, even popping in some sweets and squash for our son which was very thoughtful, with water, wine and beers already cooling in the fridge too! Use of pool towels was an added bonus. Some toiletries such as handwash and moisturiser, soaps, new flannels, cotton pads for face cleansing and two hairdryers were supplied too which all helped to make for an easy start to the holiday. Lots of stations on the TV, lots of novels on the bookshelves, beach parasol, buckets and spades too. Large TV in the master bedroom also a nice touch. The property has private use of 4 very comfy sun loungers and some side tables for a lazy day by the pool. Plenty of crockery, pots and pans etc. Really well equipped property. Plenty of space to eat and relax on the terrace. Use of a hot tub too. A car is essential to get to local amenities but the nearest mini supermarket is a couple of minutes away with a very nice cafe next door too. The marina at Vilamoura is a short drive away but be prepared for a little traffic queuing as you get close to the centre. It is a very pleasant marina with a very large selection of restaurants for every taste and lots of icecream kiosks to keep the kids happy. We found Quarteira is the most accessible of the two resorts and has some good restaurants. We found a fantastic churrasqueria called Rei do Churrasco a short drive away, full with locals as well as tourists that served excellent food, don't let the exterior fool you...you could easily pass by without noticing it, but it is worth booking a table. Recommend the chicken with Piri-piri sauce. We would recommend packing a cool bag for trips to the beach as there isn't one at the apartment. We enjoyed our stay at this apartment and have already recommended it to friends. This is the second time we have stayed in this apartment, the first time in 2009 and the second time this year, 2017. The apartment itself is spacious, with a fantastic patio area with a dining table and chairs, as well as an outside sofa/chairs/table to relax at. Looking over the peaceful pool area in the evening, or if it gets too hot in the day is great. The pool area is nice and quiet so great for chilling out. The location is around a 45-60 minute walk into Vilamoura and the marina, however a short drive with plenty of parking. I would recommend here as a great base to travel around, or if you want a peaceful and relaxing holiday in beautiful surroundings. Colin and Karen could not have been more welcoming or helpful during our stay. Overall, I would recommend staying here and would fully expect to be returning in the near future. The apartment is great and very well equiped. It has a great balcony with a big table where you can have all your meals, with direct access to the graden and pool, but that in did gives you a lot of privacy. It lacks a Matrimonial Bed and it only has english SKY TV by Satelite but with a very few opened channels. If you have a Sky Card bring it with you. The Algarve is home to magnificent beaches, quiet fishing villages, top-class golf courses and bustling resorts. It has a Mediterranean climate and a coastline that stretches from Tavira in the eastern Algarve to Sagres in the west. It has something for everyone, from vibrant tourist complexes to history-packed towns, making it one of the most popular tourist destinations in Europe. This accommodation in Vilamoura is set in a quiet and safe complex, with the town centre, the marina and the award-winning Falesia beach all a 3 minute drive away. The sports facilities are the best in the Algarve, which also includes 5 superb golf courses all within a short distance of the apartment. The busy marina, the largest in Europe, comes alive at night with a huge choice of bars and restaurants that surround it, making this the ideal base for all Vilamoura has to offer.